An 8-year-old boy presented to the emergency department with odynophagia of secretions, dysphagia of liquids, and sialorrhea. His exam was negative for stridor, hypoxia, and aphonia. The patient was slightly tachycardic and afebrile. He had no relevant medical history or prior imaging. 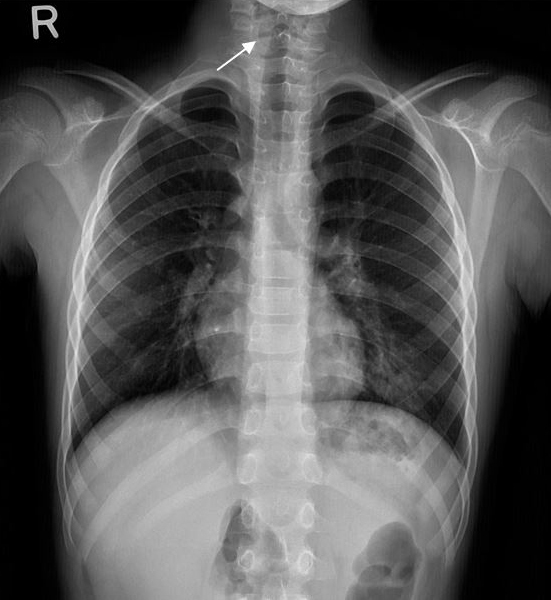 AP chest radiograph (Figure 1) demonstrated a subtle round radiolucent mass-like object projecting over the esophagus at the level of the C5-C6 interspace. 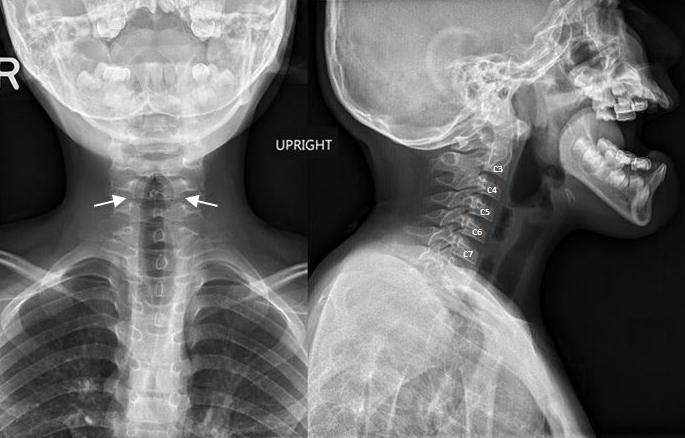 AP and lateral neck radiographs (Figure 2) demonstrated the 2.4 cm radiolucent object with radial spoke-like lines extending peripherally. The object extends from the C4 to C6 vertebral bodies. The object appears to fill the esophageal lumen with prominent proximal esophageal dilatation and paraesophageal soft tissue edema resulting in mild focal narrowing of the trachea posteriorly. Gross specimen (Figure 3A) following open rigid laryngoscopic retrieval reveals a small intact plastic wheel from a toy truck, with impressive radiographic resemblance (Figure 3B). Radiolucent impacted esophageal foreign body. Clinical differential diagnosis: mediastinal mass, esophagitis, or esophageal stricture. Radiography plays a critical role in the diagnosis and management of ingested and aspirated FBs, especially in the pediatric population. Prompt radiologic recognition of impacted FBs is necessary for adequate treatment, as some ingested objects oblige emergent/urgent retrieval (i.e. batteries, magnets, sharps, larger impacted objects). Quickly identifying the radiographic signs of impaction and aspiration is also crucial, especially as many FBs are radiolucent. While radiography remains the modality-of-choice in diagnosing ingested and aspirated FBs, fluoroscopy and enhanced CT can prove very helpful with radiolucency and other complicated cases. Complications of retained FBs include inflammation, obstruction, bleeding, abscesses, fistualization, strictures, or even death. Endoscopic retrieval may be necessary in up to 20% of cases. Pugmire BS, Lim R, Avery L Review of Ingested and Aspirated Foreign Bodies in Children and Their Clinical Significance for Radiologists. RadioGraphics. 2015; 35(5): 1528-1538. Kramer RE, Lerner DG, Lin T et al. Management of Ingested Foreign Bodies in Children: A Clinical Report of the NASPGHAN Endoscopy Committee. Journal of Pediatric Gastroenterology & Nutrition. 2015; 60: (4) 562–574. Pinto A, Lanza C, Pinto F et al. Role of Plain Radiography in the Assessment of Ingested Foreign Bodies in the Pediatric Patients. Seminars in Ultrasound, CT and MRI. 2015;36(1): 21-27. Grassi R, Faggian A, Somma F et al. Application of Imaging Guidelines in Patients With Foreign Body Ingestion or Inhalation: Literature Review. Seminars in Ultrasound, CT and MRI. 2015;36(1): 48-56. Shih C, Hao C, Wang Y et al A New Trend in the Management of Esophageal Foreign Body: Transnasal Esophagoscopy Otolaryngology. Head and Neck Surgery. 2015; 153: 189-192. Miller RS, Willging JP, Rutter MJ et al Chronic esophageal foreign bodies in pediatric patients: a retrospective review. International Journal of Pediatric Otorhinolaryngology. 2004; 68(3); 265-272. Athanassiadi K, Gerazounis M, Metaxas E et al. Management of esophageal foreign bodies: a retrospective review of 400 cases. European Journal of Cardiothoracic Surgery. 2002;21(4)653-656. Macpherson RI, Hill JG, Othersen HB et al. Esophageal foreign bodies in children: diagnosis, treatment, and complications. American Journal of Roentgenology. 1996; 166(4): 919-924. Webb WA Management of foreign bodies of the upper gastrointestinal tract: Update. Gastrointestinal Endoscopy.1995; 41(1): 39-51. Newman DE The radiolucent esophageal foreign body: An often-forgotten cause of respiratory symptoms. The Journal of Pediatrics. 1978; 92(1) 60-63. Plowman RS, Dance L, Barnes C, Jorgensen SA, Towbin AJ, Towbin R. A radiolucent esophageal foreign body: Diagnosis, management, and potential complications. Appl Radiol. 2018;47(4):28-29. Prepared by Dr. Plowman while practicing at the Mayo Clinic Arizona, Scottsdale, AZ; Dr. Dance, Dr. Barnes, Dr. Jorgensen and Dr. Richard Towbin while practicing at Phoenix Children’s Hospital, Phoenix, AZ; and Dr. Alexander Towbin while practicing at Cincinnati Children’s Hospital, Cincinnati, OH.